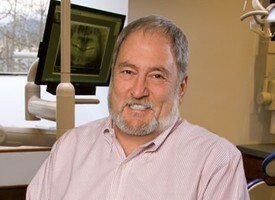 Dr. Chester was born and raised in Washington, D.C. His father had a home dental office, and some of his earliest memories were playing “spaceship” in the dental chairs! He attended both public and private schools and spent his summers on the Chesapeake Bay sailing with his Dad. He later attended Coe College, San Francisco Art Institute, and Montgomery Junior College where he became a Dental Laboratory Technician. Dr. Chester owned and operated a dental crown and bridge laboratory in rural Hawaii, before deciding to go back to school and become a dentist. He graduated from the University of Maryland Dental School in Baltimore, Maryland in 1992 at age 40 and had practiced in Washington DC and Hawaii before moving to Bellingham, WA in 1998. Dr. Chester is a member of the American Dental Association, the Washington State Dental Association, and the Mt. Baker Dental Society. He enjoys photography, bronze sculpting, and writing software. He married his wife Margaret in 1981. Margaret has a master’s degree in public health education, has extensive experience as a grief and bereavement counselor with Hospice, is a certified Yoga instructor, and is an author of several books. Their 31-year-old son is an independent welder.